Home » What are Linear Heat Detectors ? 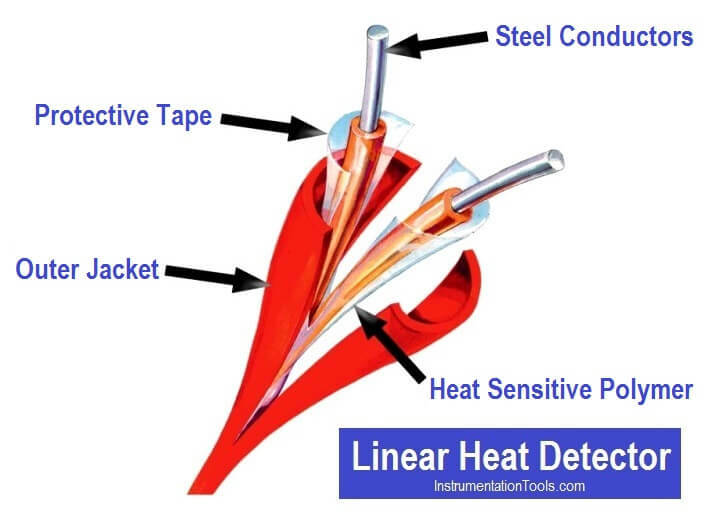 Linear Heat Detection (LHD) (also known as Linear Detection Wire or Linear Heat Detection Cable or Linear Heat) is a very commonly used method of fire detection. It can detect a fire anywhere along the length of the cable, and can be of lengths in excess of a kilometer. Linear Heat Detection (LHD) cable is essentially a two-core cable terminated by an end-of-line resistor (resistance varies with application). The two cores are separated by a polymer plastic, that is designed to melt at a specific temperature (commonly 68 °C for building applications), and without which causes the two cores to short. This can be seen as a change in resistance in the wire. The linear heat detectors shall sense an overheat condition at any point along its length and pinpoint its location. The heat detection system shall comprise a heat sensing cable and a monitoring /control unit. A change in temperature along the sensing cable shall cause a relative change in resistance of the cable. This change shall be detected by the monitoring /control unit which shall signal an alarm at the pre set temperature. The sensing cable may be multicore or coaxial. One end shall be connected to the monitoring unit. The other end shall be terminated so as to create a loop which shall be continuously monitored for open and short circuit fault, and alarm condition. Following are some minimum requirement applicable for linear heat detector, however requirements vary from industry to industry. The outer jacket shall be made of material that resists corrosion, chemicals, moisture etc. The linear heat detector cable and monitoring system shall be suitable for operation on a nominal 24V DC supply. The alarm condition shall be latched at the control unit, with reset facility from the Fire and Gas panel, and locally on the control unit. The unit shall provide outputs for fault and alarm conditions that are compatible with the main Fire and Gas panel. Sensing cable and any termination units required shall be certified for use as part of an IS circuit when installed in hazardous area. What is End-of-Line Resistor ?